SW-Control is a single channel controller for battery operated toys and appliances. Light weight and small enough to be fastened to a toy. 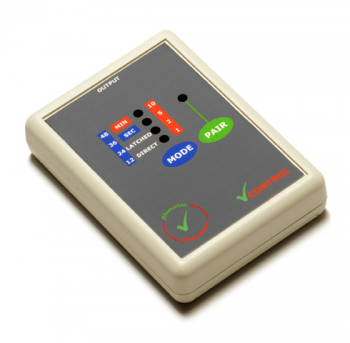 The SW-Control unit may be used with any of the SimplyWorks transmitters to control toys, lamps, fans, or any battery operated equipment via a standard 3.5mm jack plug. SW-Control has an operating range of 10 meters (32'), and features Direct, Latched, Timed (minutes and seconds) mode options. The duration in timed modes can be selected using LEDs. Can be paired with up to three switches to allow interactive and cooperative games to be devised. Use it with your own switches using one of the wireless SW-Send interfaces. Takes 2 x AAA batteries.